The Roots Music Series celebrates Cajun/Zydeco Night at thePioneerMuseuminFredericksburgon Saturday, July 30. 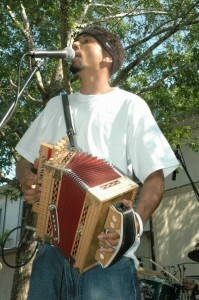 Zydeco Blanco starts the evening at 6 p.m., followed at 7 p.m. by Charles Thibodeaux and the Austin Cajun Aces. From 8:40 p.m. to 10 p.m., Cedryl Ballou and the Zydeco Trendsetters provide the live music. Dancing is encouraged. Beginning at 5 p.m., guests can enjoy the Longhorn Street Cafe’s signature grilled-to-order 12-oz ribeye, or choose the Shrimp Etoufee or Jambalaya, all with rice and beans, salad and Irish cream crisp apple cobbler, for $10. Wine, beer, sodas, and water are also offered. ThePioneerMuseumis located at325 West Main StreetinFredericksburg, with event entrance onMilam Street. Parking is free, and guests are welcome to bring their own lawn chairs. Net proceeds support the mission of the Gillespie County Historical Society. For information: 830-997-2835, www.pioneermuseum.net, info@pioneermuseum.net. Fredericksburg Opera Fest – July 23-24 Set The Date!